CYCLINGFORUM.COM -- View topic - Burning the house down! 10/28/18 9:09 AM Burning the house down! Well, I came pretty close to burnning my own house down! One of my wall socket had been giving me some intermittent troubles. It’s the only socket I plug in and unplug my laptops frequently. (there’re 2, one for work, one personal) After a few week of that, I decided to move them to a different socket. All was well. Still, I thought I’d look into why it was giving me trouble WHEN I HAVE TIME! That “time” is today (the rain last night left the road wet and me unmotivated to go out to ride). It didn’t take much look “into”. The face plate was warped and half melted! Looking inside the socket, one of the live feed was charred and blackened . The connector broke off easily as I pulled th bundle of wires out out the wall. It’s not clear whether that was the cause of the charring, or the result. Go out and buy a lottery ticket, because your luck is obviously running strong today. Likely you had a hot wire insulation failure (cracked or rubbed off) or a wire pulled out of a wire nut and that touched a conductor. Circuit breakers should catch something like this, but if the voltage leakage is low it might not be enough to trigger the breaker but still enough to generate a lot of heat. You might need to pull new wire to that box if you can't find the failure point in the wire bundle. The services of a professional or at least someone with experience is probably in order. When was the last time you, or anyone of us manually did a reset/tripped our 40+ year old breakers? You should reset them yearly, so the contacts don't fuse from minor arching, or oxidation for that matter. This way they will trip before a short turns a wire in the wall into primachord and starts a fire. I have replaced all but the main breaker in my house/box since we bought this house. And I replaced the entire panel in my shop. As it was internally oxidized beyond belief. I suspect a the leaking roof I replaced had the humidity high out there in the rainy seasons over many years before I bought the place. Also replaced every receptacle out in the shop. After reading April's post. I think I will replace the receptacles in the house, all of them. I have only replaced the few that were loose and worn out. No small coincidence the ones replaced already ARE the ones most used for lap top and phone chargers etc. Glad you story did not end with smoke April! Nice bushing on the wire, NOT! I use near boiling water mixed with Zepp Citrus de-greaser from Home Depot for such HD tasks. I'd probably have the 'tempered' wire eliminated from that equation rather than just putting in a new receptacle. Maybe an electrician should come, and inspect/replace a bunch of those. That was the burned socket. Pretty shocking! Obviously, the wires that got their insulation burned away need to be cut. House is...yep 40 year old! "Obviously, the wires that got their insulation burned away need to be cut. " Cut back past the tempered section. You are lucky you have copper and not Aluminum they allowed nationally for a period. I forget what decade that was, or part[s] of a decade[s] et al. I have seen this when folks use a big watt electric heater and the breaker is fused. Or it is hot enough to melt the plastic in the receptacle but not throw the breaker. Like a 12 ga. wire heater into a 14 ga./15amp plug. Did your breaker for that circuit actually pop and need to be reset? I'd want to make sure it still can by one method or the other. Have you used an electric heater or element device/appliance in that plug of late? My sense/guess is something with a bigger load quite possibly was plugged into that socket for a longer length of time. The plug held it together until once the plug was removed the melted/missing plastic allowed the part to shift outward. I say this partly because I see no evidence of heat at the box side. While I do use an electric heater in the same room, it was plugged into a different socket. (Yes, I suspected the heater immediately and right away inspected the socket the heater was plugged into) That one (2nd pix I sent you) didn’t show any sign of burning or charring. That said, the 2nd socket is on the same loop. So I suspect the current passed through the first socket was significant. When there’s an intermittent gap or corrosion, it may generate enough heat? Curious what size wire is shown in the photo. The industrial installations I see now has the electrical engineers (who likely wouldn't be doing home design work) up size the branch circuit wires. Our general use circuits are all 20 amp breakers and devices, with #10 minimum. My stage lighting stuff is all #8 due to long cable runs. At least that’s what my wire stripper says, roughly. If the wire was not super tight and your heater/load down circuit caused an arc in that receptacle, I buy that theory as plausible. What Steve said, and when resistance increases over time at any connection point a whole lot of heat can be created, but without the rise in current that is needed to trip a breaker or blow a fuse. This sort of failure mode is common at the battery terminal clamps of vehicle batteries, where the added resistance of the connection over time is often helped along by acidic gasses emitted from an aged battery that should have been replaced. The important thing with such failures is that the heat and combustion activity is fully contained by the box and plate, that these parts be made from sufficiently heat-resisting material. Also that the wiring insulation and any other composite materials be made of non-combustible material relatively speaking. 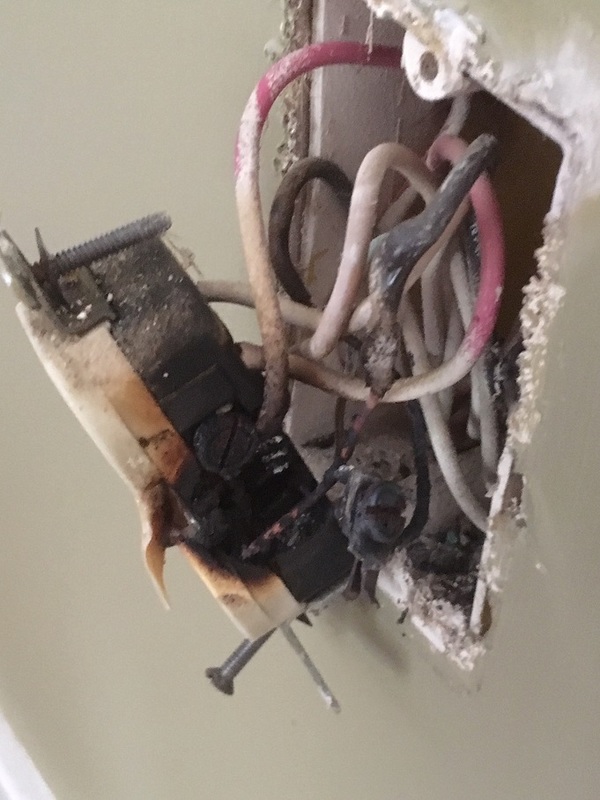 These sort of connection failures should be entirely fail-safe episodes, but when the face plate can melt, or when pieces of glowing-hot insulation material can escape the enclosure, then it becomes a serious fire hazard. This is a good example of why an electric heater in particular should never be left unattended. Agree with the analysis that it probably was a loose wire right at the receptacle. Enough current could flow to provide function but every time things wiggled there was a make and break action that effectively produced intermittent arcing and the associated heat and charring. This is more of a problem with the "push-in" connectors but if the installer didn't firmly tighten the screw holding the wire, same thing can happen. Yep! The wire that’s charred was a push-in! Enough damage the screw connector next to it was breaking off... you can see clearly from the picture. In fact, a quarter of the receptacle was almost gone, disintegrated! Bad grounding can cause similar problems, too. A few years back, I had a problem with voltage fluctuations in the house. I turned out that the main ground for the house was corroded and loose. It made a bit of a mess inside the box, but once everything was replaced, the problems were gone and haven't recurred. There is a low spot grade wise on the way out of my dead end street. We are past it on the way up a small hill. Since we have been here, two houses in the low spot have had the main ground to their electric services rot and be replaced after serious symptoms. We have underground service on the street, no poles. I assume the ground rod in in the crawl below the panel which is on an inside wall. But these folks lost the main ground to the meter pan feed, not good. We also for the first few years had power failures yearly. The main feed to the underground transformers blew through the insulator several times and pops the breakers at the pole on the main street where the feed goes down to underground to feed the sub-div. They finally ran a conduit in the low section and a new feed. Workers told me the soil is acidic in the low spot, and in the 70s they just buried the main feeds, no conduits. Lasted almost 40 years in the acidic spot, still orig up the hill in the sub-div. These folks also had crazy frequent leaks in the original steel pipes and re-pipes. Starting with the next house toward the low spot we are the second house with original steel pipes still in service with no leaks. When I saw the title I thought you were talking about the wacko in California who managed to burn his parents house down by attempting to eradicate some spiders with a blowtorch. I discovered I came close to exercising one myself. That's a humbling experience. The electric heater, which is clearly the culprit, draws 12Amps! On the same 15A circuit, are my "Entertainment Center". Meaning the radio/speaker/TV. And a floor lamp. When I'm sitting at the couch, I OFTEN have my laptop on my lap to browse the web or answering emails. The laptop is occasionally plugged in when the battery is low and I don't want to stop what I'm doing. The floor lamp doesn't draw much (<1A). But the 2 laptops, according to the number on the converter, can draw ~2 amps. That doesn't leave much head room for the TV and the music maker (radio/amp/speaker), which is typically turned on. Clearly, I've been exceeding the load for the past 2 years (that's when I bought the electric heater. AND having both laptop plugged in at the socket sometimes), if only occasionally and ever so slightly (exceed the 15A limit). It's not a comforting thought that the breaker never tripped at all. have you test tripped the breaker yet? You could also put a AFCI receptacle at the first plug location of that run [or each] from the breaker panel. That will GFI protect the rest of the run of plugs on that circuit. I had thought that a GFI breaker only senses an imbalance between the current leaving the HOT wire and the same current entering the NEUTRAL wire. An increase in resistance alone would not seem to cause such an imbalance, the way that current leakage out of the appliance would cause such an imbalance (leading to the tripping of the breaker). In other words, I believe that GFI breakers are designed specifically to protect against electric shock, vs. any protection against wiring damage or against fire.